Turn your PDFs into DOC documents you can edit. PDF 2 DOC converts PDF files into Microsoft DOC documents. PDF 2 DOC preserves the text, layout and images of your original document. How to edit PDF files without purchasing an expensive PDF editor? How to extract text/images from PDF files? What you need is a PDF to DOC Converter. VeryPDF PDF to DOC Converter is such a desktop document conversion tool to convert Adobe PDF file to Microsoft Word Doc file. 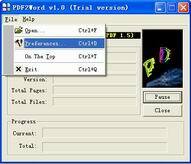 The program can extract text, images, shapes from PDF file to Word Doc file and preserve the layout. It can convert all the pages, or any pages range of the PDF file. And it is a standalone program - you can convert PDF to Word Doc without Adobe Acrobat Reader or Microsoft Word installed! You simply drag a desired PDF file to program’s window, you will receive an accurately converted RTF or DOC file immediately. It is that easy: no unnecessary configuration, no hundreds of options anymore. Drag in the file, and you’re done! And PDF to DOC Converter cares very much about accuracy of conversion, so every file you process looks exactly as it did before that. PDF 2 DOC is a standalone software, MS DOC, Adobe Acrobat and Reader NOT required! Support both 32bit and 64bit systems. Multi-language text support. Accurately convert all Unicode-based text, in any language. Retain font appearance. When a PDF file uses a font not installed on your system, we'll replace it with the best alternative font.